Can I take out the sugar alcohols? Will it effect the texture? Hi Carol! I haven’t made these without the sugar alcohol erythritol. I would recommend using some kind of sweetener. 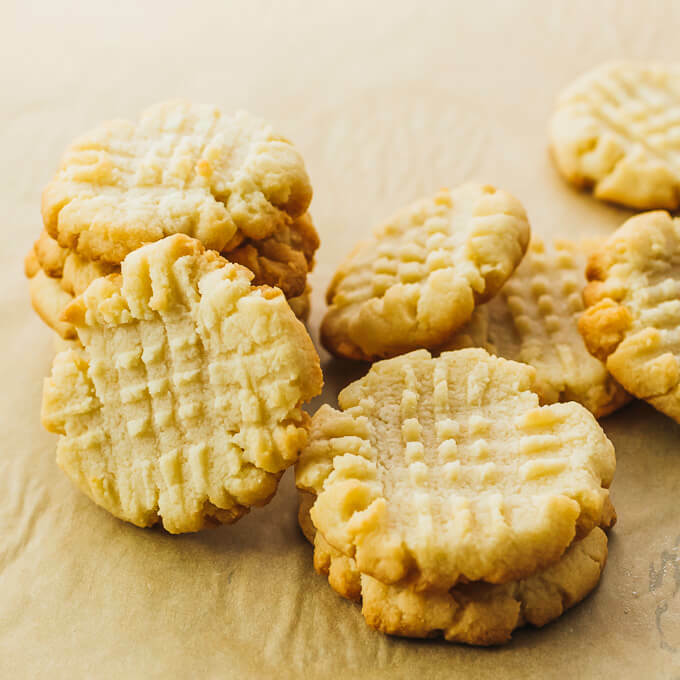 There’s a previous comment by another reader (Kharen) who said she substituted “3 drops liquid caramel stevia for the erythritol + 1 tsp unsweetened sunbutter, and I also added an additional 1/4 cup almond flour” and said that it turned out well. I made these cookies and they turned out delicious. Taste like shortbread cookies except I used Splenda. Think I could use this as the crust for a keto lemon bar? Hi Delma! Yes, I think that could work. Another option is to use almond flour, melted butter, and a bit of erythritol for the crust — I do this all the time for cake and pie crusts and it works great. 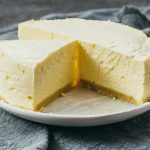 For proportions, see the recipe at https://www.savorytooth.com/instant-pot-cheesecake/ which makes enough crust for a 6 inch diameter round pan, or see https://www.savorytooth.com/pumpkin-cheesecake-bars/ for a 9×13 inch pan. They’re in the oven right now!! I tasted the dough, sooo yummy. I added a few tsps of water to make it form better and some cinnamon. Definitely my new fave, and probably a staple in my low carb high fat diet!! I made a couple mistakes in my recent post, Lena instead of Lens. lol…and I am on a low carb high fat (LCHF) diet. Cookies were awesome. I will definitely make them again. So easy to make. Since I had all the ingredients and I have a sugar craving for my LCHG diet, I made them last night. I used almond extract in place of vanilla, and powdered erythritol. In oven for 1 minute too long, they still turned out great and tasted great, just a “little” crunchy. Next time, I will be more attentive and they will be perfect. But still perfect they way they tasted, cause I had a hard time of resisting eating more than one late last night. Very addictive. 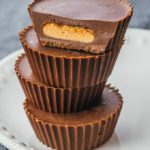 I have made these twice now and they are so good and easy to make. Second time I double the recipe because the first time my husband and I are all of them within 24 hours. Thank you for this recipe for I am eating less carbs and this helps even though it has butter and sugar. Amazing!! Added the juice of half a lemon and they were delicious! These are amazing! I followed the resipe but added 1/2 tsp almond extract and slivered almonds. Made 12 perfect cookies. Great with tea! I made this recipe! 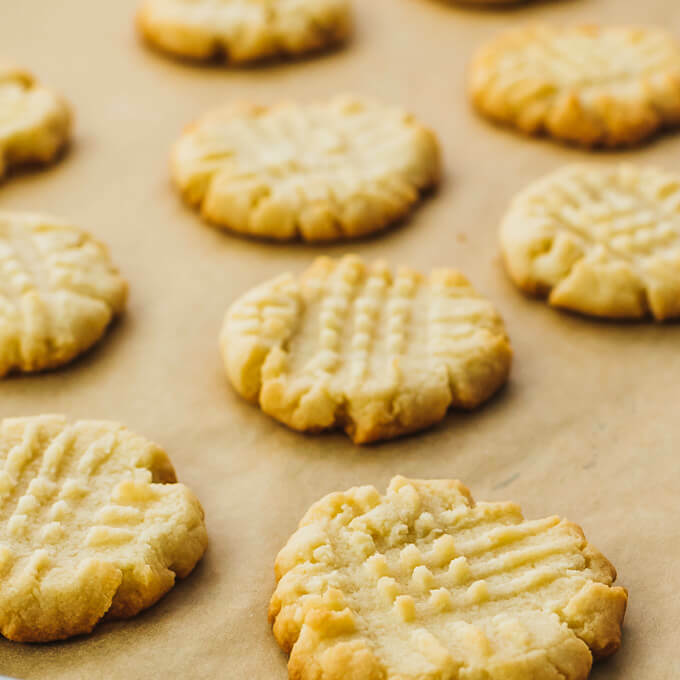 I substituted 3 drops liquid caramel stevia for the erythritol + 1 tsp unsweetened sunbutter, and I also added an additional 1/4 cup almond flour – they turned out amazingly! I tried doubling the recipe with half almond and half coconut flour. I also used truvia liquid sweetener. I can not get the dough to stick together. Any suggestions? Hi Tracey! This recipes requires 100% almond flour and so I don’t recommend subbing 50/50 almond flour and coconut flour. I also don’t recommend using a liquid sweetener because then the ratio of wet to dry ingredients is off. Please use the recommended sweetener in the recipe, which is powdered erythritol. Could you substitute Monk Fruit Sweetener? Yes but you’ll need to powder it. Don’t use it in granulated form. Also, use less like 3 tablespoons. I just made these with monk fruit sweetner and used 3/4 the amount and boy was it delicious. My 3 yr old said ” you made a good cookie mom, these are so good! Oh my word,these are delicious. Had these for breakfast on a rainy Saturday morning! Yummo! Thanks for the recipe! Could I use Swerve instead of the erythritol? 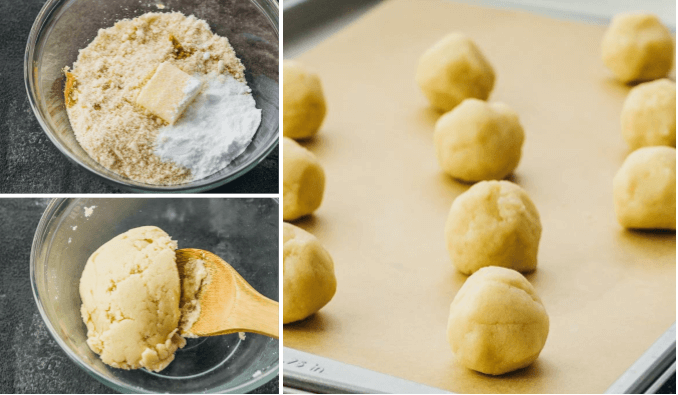 You can use powdered or confectioners Swerve but decrease it to 3 tablespoons instead of 1/4 cup, and add another tablespoon of almond flour. Hello! I love these cookies! I tried switching the almond flour for coconut and the dough didn’t come out right. I tried adding quite a bit more butter and they still crumbled:( Any suggestion for using coconut flour that will make this come out right?!? 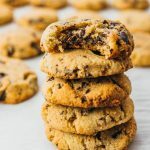 I don’t recommend using coconut flour for these cookies, sorry! 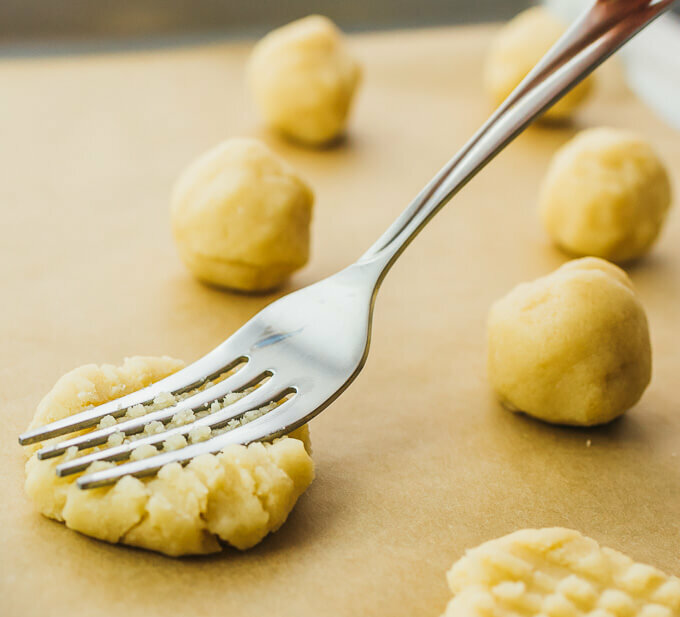 Coconut flour is a lot more absorbent than almond flour, so you’ll need to use a lot less. I used lemon juice instead of vanilla. Gave them a little more flavor. 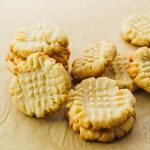 I always do that with my regular sugar cookies and everyone loves the extra tang! Does it matter if you don’t have a powdered sweetener? Could I just ground up granulated stevia and have it work the same way? Thanks! Hi Paige! I recommend using a powdered sweetener for best results. If you use granulated erythritol, you can ground it up using a blender to get the powdered form. 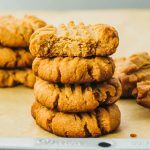 Stevia is a lot sweeter than erythritol so you can’t substitute 1:1 in this recipe and the texture will be off. I recommend using erythritol or something with similar sweetness. FYI erythritol is about 70% as sweet as table sugar.